Britain's political parties are in a bidding war to attract the votes of working parents with pre-school children. So how do their different policies stack up? All three and four-year olds in England are entitled to 570 hours of free early education or childcare a year, which works out as 15 hours each week for 38 weeks of the year. Over the course of the latest Parliament, the coalition government expanded this to the most deprived two year olds. The government has also said it would introduce a new scheme for tax-free childcare from autumn 2015, aimed at working parents earning less than £150,000 a year, and from September 2015 all parents on the new universal credit would be entitled to an 85% subsidy on childcare spending. 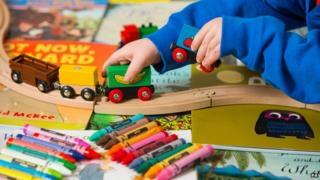 The government offers a list of possible providers of its free education and childcare. They include nursery schools, children's centres, some playgroups, childminders and Sure Start centres. The proposals relating to universal credit and tax breaks would apply in England, Scotland and Wales. The Liberal Democrats would extend the existing entitlement of 15 hours a week free childcare to all two-year-olds. It is also pledging the same amount of childcare for all children of working parents aged between nine months and two years. Nick Clegg's party also has a "long-term ambition" to increase free provision to 20 hours a week for all two, three and four-year-olds and for children aged between nine months and two years of working parents. The party says its total package would cost £2.8bn. Labour says it would extend the current free childcare for working parents with three and four year olds from 15 to 25 hours per week. The party says this would be worth £1,500 per child. It also says it would double the number of childcare places at Sure Start centres and guarantee childcare from 08:00 to 18:00 for parents of primary school children. The Conservatives say they would double the existing free childcare provision for three and four-year-olds, to 30 hours a week, saving parents £5,000 a year. Families where all parents are working would be entitled. In Scotland, the SNP has promised a guaranteed free 30 hours of childcare a week for three and four-year-olds, up from 16 hours. Plaid Cymru is calling for full-time education for all children from the age of three in Wales, which would cost £300m. The Green Party says it would build a free but voluntary universal early education and childcare service for all children from birth until a raised compulsory schooling age of seven. UKIP says it will be producing plans to reduce the cost of childcare as well as "wrap-around" childminding in the form of after school and breakfast clubs.